While Midway was not totally responsible for this game, they should have realized the biggest problem in the game before it should have been released : the graphics. While some would say graphics aren't everything, those who bought a next generation console expect more out of their games, rather than dated material. While Point Of View managed to get the game play on this version of SpyHunter, they botched the graphics severely. As a port of the PS2 game, how do you manage to get pixelated textures? The PS2 version has the textures smoothed out. Somehow, the X-Box version had smooth textures, and it was also ported by Point Of View. But how did they mess up the graphics of the GCN version so bad? And what was the rush? The game came out in March 2002! For those who have not heard of SpyHunter, or don't know what it's about, it's a revival of the arcade classic made in the 1980s. This time, you're going after the head of the NOSTRA corporation, who plans on unleashing 4 huge and devastating missiles called the "Four Horsemen" (of the apacolypse). Great idea, except I think the leader would do himself in as well if those missiles went off. I guess video games don't have to have a logical storyline, right? So, you are off and running in your G-6155 autocar, equipped with weapons and items straight out of Goldfinger. That's right, you have guns, missiles, oil slicks and smoke screens. Who says ingenuity is dead? SpyHunter consists of 14 stages in places ranging from Monte Carlo, Venice and places in South America. Your objectives vary, but remain the same, blow something up. Sometimes you'll have to escape or protect something, but most of the time it's blowing crap up. And it's pretty fun, too. Really, this is how 007 Racing should have been (it was a game for the PS1 released in 2000). But depending on how good you are, this game may not last too long, unless you go for the unlock able secrets. At least the game holds off your progression by having a certain number of goals to complete before you move on. So completing only the main objective just won't do. The graphics, like I said, were disappointing. This is the Gamecube, not the PS1. To be fair, the polygon structures aren't so bad, and the game is anti-aliased. But someone forgot to filter the textures or smooth them out. And it's not just a few things that are pixelated, it's pretty much everything except your car. You won't notice it as much in water or if you're going really fast, but it is painfully obvious most of the time. Also, the effects such as explosions are pixelated. I can see how that would happen, since they used a FMV effect for the explosions, and that probably didn't translate well into the other versions (the Xbox version has pixelated explosions and effects). Why Paradigm or Midway could not port this game is a mystery to me, as Point Of View managed to put out a sloppy product. Surprise, surprise, they also ported Smashing Drive, which looks crappier than this. The sound is hit and miss. The sound in the FMV scenes are horribly compressed and sound pretty bad. The music and some of the effects in game are pretty good, but there are some sound effects that come off as tinny. There's room for the sound on the optical disc, so why does it sound so half-assed? 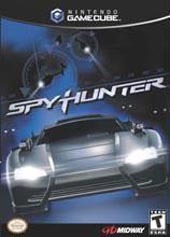 I would recommend SpyHunter if the graphics were on par with the PS2 version. The truth is, the graphics are very disappointing, and that does hurt the game. Not placing so much emphasis on the graphics, but more because this is a result of a quick and dirty port that Midway O.K. 'ed in quality control. Why they found this acceptable is a mystery to me. But, the game is pretty fun to play, and I played the game until I unlocked almost everything, including secrets. But this game is also pretty short, so on all systems, a rental would probably do you fine. If you were to pick up Spy Hunter, get the PS2 version if you can. While I try to support the GC in every way, in this case, you would be better off getting the version that was completed first, as the quality would be much better than a port. Would have been a solid port if the developer hadn't screwed up the graphics so bad.